Hydroxide is a diatomic anion with chemical formula OH−. It consists of an oxygen and hydrogen atom held together by a covalent bond, and carries a negative electric charge. It is an important but usually minor constituent of water. It functions as a base, a ligand, a nucleophile and a catalyst. The hydroxide ion forms salts, some of which dissociate in aqueous solution, liberating solvated hydroxide ions. Sodium hydroxide is a multi-million-ton per annum commodity chemical. A hydroxide attached to a strongly electropositive center may itself ionize, liberating a hydrogen cation (H+), making the parent compound an acid. The corresponding electrically neutral compound •HO is the hydroxyl radical. The corresponding covalently-bound group –OH of atoms is the hydroxyl group. Hydroxide ion and hydroxyl group are nucleophiles and can act as a catalyst in organic chemistry. Many inorganic substances which bear the word "hydroxide" in their names are not ionic compounds of the hydroxide ion, but covalent compounds which contain hydroxyl groups. 4, which results in a decrease in hydrogen cation concentration and an increase in hydroxide ion concentration. pOH can be kept at a nearly constant value with various buffer solutions. 2 (114 pm). 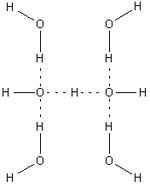 In aqueous solution the hydroxide ion forms strong hydrogen bonds with water molecules. A consequence of this is that concentrated solutions of sodium hydroxide have high viscosity due to the formation of an extended network of hydrogen bonds as in hydrogen fluoride solutions. 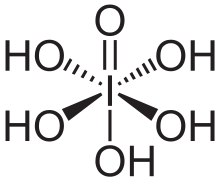 In solution, exposed to air, the hydroxide ion reacts rapidly with atmospheric carbon dioxide, acting as an acid, to form, initially, the bicarbonate ion. The equilibrium constant for this reaction can be specified either as a reaction with dissolved carbon dioxide or as a reaction with carbon dioxide gas (see carbonic acid for values and details). At neutral or acid pH, the reaction is slow, but is catalyzed by the enzyme carbonic anhydrase, which effectively creates hydroxide ions at the active site. Solutions containing the hydroxide ion attack glass. In this case, the silicates in glass are acting as acids. Basic hydroxides, whether solids or in solution, are stored in airtight plastic containers. The hydroxide ion can function as a typical electron-pair donor ligand, forming such complexes as [Al(OH)4]−. It is also often found in mixed-ligand complexes of the type [MLx(OH)y]z+, where L is a ligand. The hydroxide ion often serves as a bridging ligand, donating one pair of electrons to each of the atoms being bridged. As illustrated by [Pb2(OH)]3+, metal hydroxides are often written in a simplified format. It can even act as a 3-electron-pair donor, as in the tetramer [PtMe3(OH)]4.
with a pKa of about 5.9. The infrared spectra of compounds containing the OH functional group have strong absorption bands in the region centered around 3500 cm−1. The high frequency of molecular vibration is a consequence of the small mass of the hydrogen atom as compared to the mass of the oxygen atom and this makes detection of hydroxyl groups by infrared spectroscopy relatively easy. A band due to an OH group tends to be sharp. However, the band width increases when the OH group is involved in hydrogen bonding. A water molecule has an HOH bending mode at about 1600 cm−1, so the absence of this band can be used to distinguish an OH group from a water molecule. When the OH group is bound to a metal ion in a coordination complex, an M−OH bending mode can be observed. For example, in [Sn(OH)6]2− it occurs at 1065 cm−1. The bending mode for a bridging hydroxide tends to be at a lower frequency as in [(bipyridine)Cu(OH)2Cu(bipyridine)]2+ (955 cm−1). M−OH stretching vibrations occur below about 600 cm−1. For example, the tetrahedral ion [Zn(OH)4]2− has bands at 470 cm−1 (Raman-active, polarized) and 420 cm−1 (infrared). The same ion has a (HO)–Zn–(OH) bending vibration at 300 cm−1. Sodium hydroxide solutions, also known as lye and caustic soda, are used in the manufacture of pulp and paper, textiles, drinking water, soaps and detergents, and as a drain cleaner. Worldwide production in 2004 was approximately 60 million tonnes. The principal method of manufacture is the chlor-alkali process. Although the base strength of sodium carbonate solutions is lower than a concentrated sodium hydroxide solution, it has the advantage of being a solid. It is also manufactured on a vast scale (42 million tonnes in 2005) by the Solvay process. An example of the use of sodium carbonate as an alkali is when washing soda (another name for sodium carbonate) acts on insoluble esters, such as triglycerides, commonly known as fats, to hydrolyze them and make them soluble. Bauxite, a basic hydroxide of aluminium, is the principal ore from which the metal is manufactured. Similarly, goethite (α-FeO(OH)) and lepidocrocite (γ-FeO(OH)), basic hydroxides of iron, are among the principal ores used for the manufacture of metallic iron. Numerous other uses can be found in the articles on individual hydroxides. Aside from NaOH and KOH, which enjoy very large scale applications, the hydroxides of the other alkali metals also are useful. Lithium hydroxide is a strong base, with a pKb of −0.36. Lithium hydroxide is used in breathing gas purification systems for spacecraft, submarines, and rebreathers to remove carbon dioxide from exhaled gas. The hydroxide of lithium is preferred to that of sodium because of its lower mass. Sodium hydroxide, potassium hydroxide and the hydroxides of the other alkali metals are also strong bases. Beryllium hydroxide Be(OH)2 is amphoteric. The hydroxide itself is insoluble in water, with a solubility product log K*sp of −11.7. Addition of acid gives soluble hydrolysis products, including the trimeric ion [Be3(OH)3(H2O)6]3+, which has OH groups bridging between pairs of beryllium ions making a 6-membered ring. At very low pH the aqua ion [Be(H2O)4]2+ is formed. Addition of hydroxide to Be(OH)2 gives the soluble tetrahydroxo anion [Be(OH)4]2−. 3 + OH− illustrates the strong basicity of calcium hydroxide. Soda lime, which is a mixture of NaOH and Ca(OH)2, is used as a CO2 absorbent. The simplest hydroxide of boron B(OH)3, known as boric acid, is an acid. Unlike the hydroxides of the alkali and alkaline earth hydroxides, it does not dissociate in aqueous solution. Instead, it reacts with water molecules acting as a Lewis acid, releasing protons. A variety of oxyanions of boron are known, which, in the protonated form, contain hydroxide groups. Aluminium hydroxide Al(OH)3 is amphoteric and dissolves in alkaline solution. 4 but other hydroxides usually present in the mineral, such as iron hydroxides, do not dissolve because they are not amphoteric. After removal of the insolubles, the so-called red mud, pure aluminium hydroxide is made to precipitate by reducing the temperature and adding water to the extract, which, by diluting the alkali, lowers the pH of the solution. Basic aluminium hydroxide AlO(OH), which may be present in bauxite, is also amphoteric. 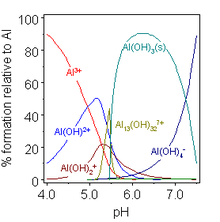 In mildly acidic solutions the hydroxo complexes formed by aluminium are somewhat different from those of boron, reflecting the greater size of Al(III) vs. B(III). The concentration of the species [Al13(OH)32]7+ is very dependent on the total aluminium concentration. Various other hydroxo complexes are found in crystalline compounds. Perhaps the most important is the basic hydroxide AlO(OH), a polymeric material known by the names of the mineral forms boehmite or diaspore, depending on crystal structure. Gallium hydroxide, indium hydroxide and thallium(III) hydroxides are also amphoteric. Thallium(I) hydroxide is a strong base. Carbon dioxide is also known as carbonic anhydride, meaning that it forms by dehydration of carbonic acid H2CO3 (OC(OH)2). Silicic acid is the name given to a variety of compounds with a generic formula [SiOx(OH)4−2x]n. Orthosilicic acid has been identified in very dilute aqueous solution. It is a weak acid with pKa1 = 9.84, pKa2 = 13.2 at 25 °C. It is usually written as H4SiO4 but the formula SiO2(OH)2 is generally accepted . Other silicic acids such as metasilicic acid (H2SiO3), disilicic acid (H2Si2O5), and pyrosilicic acid (H6Si2O7) have been characterized. These acids also have hydroxide groups attached to the silicon; the formulas suggest that these acids are protonated forms of polyoxyanions. 3 is formed. When solutions containing this ion are acidified the ion [Sn3(OH)4]2+ is formed together with some basic hydroxo complexes. The structure of [Sn3(OH)4]2+ has a triangle of tin atoms connected by bridging hydroxide groups. Tin(IV) hydroxide is unknown but can be regarded as the hypothetical acid from which stannates, with a formula [Sn(OH)6]2−, are derived by reaction with the (Lewis) basic hydroxide ion. Hydrolysis of Pb2+ in aqueous solution is accompanied by the formation of various hydroxo-containing complexes, some of which are insoluble. The basic hydroxo complex [Pb6O(OH)6]4+ is a cluster of six lead centres with metal–metal bonds surrounding a central oxide ion. The six hydroxide groups lie on the faces of the two external Pb4 tetrahedra. In strongly alkaline solutions soluble plumbate ions are formed, including [Pb(OH)6]2−. In the higher oxidation states of the pnictogens, chalcogens, halogens, and noble gases there are oxoacids in which the central atom is attached to oxide ions and hydroxide ions. Examples include phosphoric acid H3PO4, and sulfuric acid H2SO4. In these compounds one or more hydroxide groups can dissociate with the liberation of hydrogen cations as in a standard Brønsted–Lowry acid. Many oxoacids of sulfur are known and all feature OH groups that can dissociate. Telluric acid is often written with the formula H2TeO4·2H2O but is better described structurally as Te(OH)6. Ortho-periodic acid[note 6] can lose all its protons, eventually forming the periodate ion [IO4]−. It can also be protonated in strongly acidic conditions to give the octahedral ion [I(OH)6]+, completing the isoelectronic series, [E(OH)6]z, E = Sn, Sb, Te, I; z = −2, −1, 0, +1. Other acids of iodine(VII) that contain hydroxide groups are known, in particular in salts such as the mesoperiodate ion that occurs in K4[I2O8(OH)2]·8H2O. As is common outside of the alkali metals, hydroxides of the elements in lower oxidation states are complicated. 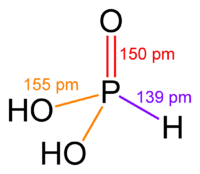 For example, phosphorous acid H3PO3 predominantly has the structure OP(H)(OH)2, in equilibrium with a small amount of P(OH)3. The oxoacids of chlorine, bromine and iodine have the formula On−1/2A(OH) where n is the oxidation number: +1, +3, +5 or +7, and A = Cl, Br or I. The only oxoacid of fluorine is F(OH), hypofluorous acid. When these acids are neutralized the hydrogen atom is removed from the hydroxide group. The hydroxides of the transition metals and post-transition metals usually have the metal in the +2 (M = Mn, Fe, Co, Ni, Cu, Zn) or +3 (M = Fe, Ru, Rh, Ir) oxidation state. None are soluble in water, and many are poorly defined. One complicating feature of the hydroxides is their tendency to undergo further condensation to the oxides, a process called olation. Hydroxides of metals in the +1 oxidation state are also poorly defined or unstable. For example, silver hydroxide Ag(OH) decomposes spontaneously to the oxide (Ag2O). Copper(I) and gold(I) hydroxides are also unstable, although stable adducts of CuOH and AuOH are known. The polymeric compounds M(OH)2 and M(OH)3 are in general prepared by increasing the pH of an aqueous solutions of the corresponding metal cations until the hydroxide precipitates out of solution. On the converse, the hydroxides dissolve in acidic solution. Zinc hydroxide Zn(OH)2 is amphoteric, forming the zincate ion Zn(OH)42− in strongly alkaline solution. Numerous mixed ligand complexes of these metals with the hydroxide ion exist. In fact these are in general better defined than the simpler derivatives. Many can be made by deprotonation of the corresponding metal aquo complex. Vanadic acid H3VO4 shows similarities with phosphoric acid H3PO4 though it has a much more complex vanadate oxoanion chemistry. Chromic acid H2CrO4, has similarities with sulfuric acid H2SO4; for example, both form acid salts A+[HMO4]−. Some metals, e.g. V, Cr, Nb, Ta, Mo, W, tend to exist in high oxidation states. Rather than forming hydroxides in aqueous solution, they convert to oxo clusters by the process of olation, forming polyoxometalates. In some cases the products of partial hydrolysis of metal ion, described above, can be found in crystalline compounds. A striking example is found with zirconium(IV). Because of the high oxidation state, salts of Zr4+ are extensively hydrolyzed in water even at low pH. The compound originally formulated as ZrOCl2·8H2O was found to be the chloride salt of a tetrameric cation [Zr4(OH)8(H2O)16]8+ in which there is a square of Zr4+ ions with two hydroxide groups bridging between Zr atoms on each side of the square and with four water molecules attached to each Zr atom. The mineral malachite is a typical example of a basic carbonate. The formula, Cu2CO3(OH)2 shows that it is halfway between copper carbonate and copper hydroxide. Indeed, in the past the formula was written as CuCO3·Cu(OH)2. The crystal structure is made up of copper, carbonate and hydroxide ions. The mineral atacamite is an example of a basic chloride. It has the formula, Cu2Cl(OH)3. In this case the composition is nearer to that of the hydroxide than that of the chloride CuCl2·3Cu(OH)2. Copper forms hydroxy phosphate (libethenite), arsenate (olivenite), sulfate (brochantite) and nitrate compounds. White lead is a basic lead carbonate, (PbCO3)2·Pb(OH)2, which has been used as a white pigment because of its opaque quality, though its use is now restricted because it can be a source for lead poisoning. The hydroxide ion appears to rotate freely in crystals of the heavier alkali metal hydroxides at higher temperatures so as to present itself as a spherical ion, with an effective ionic radius of about 153 pm. Thus, the high-temperature forms of KOH and NaOH have the sodium chloride structure, which gradually freezes in a monocinically distorted sodium chloride structure at temperatures below about 300 °C. The OH groups still rotate even at room temperature around their symmetry axes and, therefore, cannot be detected by X-ray diffraction. The room-temperature form of NaOH has the thallium iodide structure. LiOH, however, has a layered structure, made up of tetrahedral Li(OH)4 and (OH)Li4 units. This is consistent with the weakly basic character of LiOH in solution, indicating that the Li–OH bond has much covalent character. The hydroxide ion displays cylindrical symmetry in hydroxides of divalent metals Ca, Cd, Mn, Fe, and Co. For example, magnesium hydroxide Mg(OH)2 (brucite) crystallizes with the cadmium iodide layer structure, with a kind of close-packing of magnesium and hydroxide ions. x(OH)2]q+(Xn−) q⁄n·yH2O. Most commonly, z = 2, and M2+ = Ca2+, Mg2+, Mn2+, Fe2+, Co2+, Ni2+, Cu2+ or Zn2+; hence q = x.
Potassium hydroxide and sodium hydroxide are two well-known reagents in organic chemistry. The hydroxide ion may act as a base catalyst. The base abstracts a proton from a weak acid to give an intermediate that goes on to react with another reagent. Common substrates for proton abstraction are alcohols, phenols, amines and carbon acids. The pKa value for dissociation of a C–H bond is extremely high, but the pKa alpha hydrogens of a carbonyl compound are about 3 log units lower. Typical pKa values are 16.7 for acetaldehyde and 19 for acetone. Dissociation can occur in the presence of a suitable base. The base should have a pKa value not less than about 4 log units smaller or the equilibrium will lie almost completely to the left. to produce the ethoxide ion. The pKa for self-dissociation of ethanol is about 16 so the alkoxide ion is a strong enough base The addition of an alcohol to an aldehyde to form a hemiacetal is an example of a reaction that can be catalyzed by the presence of hydroxide. Hydroxide can also act as a Lewis-base catalyst. also known as saponification is an example of a nucleophilic acyl substitution with the hydroxide ion acting as a nucleophile. In this case the leaving group is an alkoxide ion, which immediately removes a proton from a water molecule to form an alcohol. In the manufacture of soap, sodium chloride is added to salt out the sodium salt of the carboxylic acid; this is an example of the application of the common-ion effect. Other cases where hydroxide can act as a nucleophilic reagent are amide hydrolysis, the Cannizzaro reaction, nucleophilic aliphatic substitution, nucleophilic aromatic substitution and in elimination reactions. The reaction medium for KOH and NaOH is usually water but with a phase-transfer catalyst the hydroxide anion can be shuttled into an organic solvent as well, for example in the generation of dichlorocarbene. ↑ The name is not derived from "period", but from "iodine": per-iodic acid (compare iodic acid, perchloric acid), and it is thus pronounced per-iodic /ˌpɜːr.aɪˈɒdᵻk/ PURR-eye-OD-ik, and not as /ˌpɪərɪˈɒdᵻk/ PEER-ee-OD-ik. ↑ Geissler, P. L.; Dellago, C.; Chandler, D.; Hutter, J.; Parrinello, M. (2001). "Autoionization in liquid water". Science. 291 (5511): 2121–2124. Bibcode:2001Sci...291.2121G. doi:10.1126/science.1056991. PMID 11251111. 2) anion. A very short, symmetric hydrogen bond". J. Am. Chem. Soc. 101 (13): 3688–3689. doi:10.1021/ja00507a059. ↑ Marx, D.; Chandra, A; Tuckerman, M.E. (2010). "Aqueous Basic Solutions: Hydroxide Solvation, Structural Diffusion, and Comparison to the Hydrated Proton". Chem. Rev. 110 (4): 2174–2216. doi:10.1021/cr900233f. PMID 20170203. ↑ Nakamoto, K. (1997). Infrared and Raman spectra of Inorganic and Coordination compounds. Part A (5th ed.). Wiley. ISBN 0-471-16394-5. ↑ Adams, D.M. (1967). Metal–Ligand and Related Vibrations. London: Edward Arnold. Chapter 5. ↑ Kostick, Dennis (2006). "Soda Ash", chapter in 2005 Minerals Yearbook, United States Geological Survey. ↑ Emsley, John (2001). "Aluminium". Nature's Building Blocks: An A–Z Guide to the Elements. Oxford, UK: Oxford University Press. p. 24. ISBN 0-19-850340-7. ↑ Emsley, John (2001). "Aluminium". Nature's Building Blocks: An A–Z Guide to the Elements. Oxford, UK: Oxford University Press. p. 209. ISBN 0-19-850340-7. ↑ Lew. Kristi., Acids and Bases (Essential Chemistry). Infobase Publishing (2009). p43. ↑ Jaunsen, JR (1989). "The Behavior and Capabilities of Lithium Hydroxide Carbon Dioxide Scrubbers in a Deep Sea Environment". US Naval Academy Technical Report. USNA-TSPR-157. Retrieved 2008-06-17. ↑ Alderighi, L; Dominguez, S.; Gans, P.; Midollini, S.; Sabatini,A. ; Vacca,A. (2009). 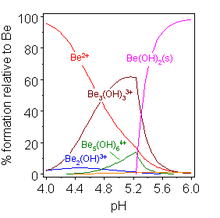 "Beryllium binding to adenosine 5′-phosphates in aqueous solution at 25°C". J. Coord. Chem. 62 (1): 14–22. doi:10.1080/00958970802474862. ↑ M. N. Sokolov; E. V. Chubarova; K. A. Kovalenko; I. V. Mironov; A. V. Virovets; E. Peresypkina; V. P. Fedin (2005). "Stabilization of tautomeric forms P(OH)3 and HP(OH)2 and their derivatives by coordination to palladium and nickel atoms in heterometallic clusters with the Mo3MQ44+ core (M = Ni, Pd; Q = S, Se)". Russian Chemical Bulletin. 54 (3): 615. doi:10.1007/s11172-005-0296-1. ↑ Fortman, George C.; Slawin, Alexandra M. Z.; Nolan ,Steven P. (2010). "A Versatile Cuprous Synthon: [Cu(IPr)(OH)] (IPr = 1,3 bis(diisopropylphenyl)imidazol-2-ylidene)". Organometallics. 29 (17): 3966–3972. doi:10.1021/om100733n. ↑ Jacobs, H.; Kockelkorn, J.; Tacke, Th. (1985). "Hydroxide des Natriums, Kaliums und Rubidiums: Einkristallzüchtung und röntgenographische Strukturbestimmung an der bei Raumtemperatur stabilen Modifikation". Zeitschrift für anorganische und allgemeine Chemie. 531 (12): 119. doi:10.1002/zaac.19855311217. ↑ Enoki, Toshiaki; Tsujikawa, Ikuji (1975). "Magnetic Behaviours of a Random Magnet, NipMg1−p(OH)2". Journal of the Physical Society of Japan. 39 (2): 317. Bibcode:1975JPSJ...39..317E. doi:10.1143/JPSJ.39.317. ↑ Bernal, J.D. ; Megaw, H.D. (1935). "The Function of Hydrogen in Intermolecular Forces". Proc. Roy. Soc., A. 151 (873): 384–420. Bibcode:1935RSPSA.151..384B. doi:10.1098/rspa.1935.0157. ↑ Hattori, H.; Misono,, M.; Ono, Y. (Editors) (1994). Acid–Base catalysis II. Elsevier. ISBN 978-0-444-98655-9. ↑ Ouellette, R.J. and Rawn, J.D. "Organic Chemistry" 1st Ed. Prentice-Hall, Inc., 1996: New Jersey. ISBN 0-02-390171-3. ↑ Pine, S.H. ; Hendrickson, J.B.; Cram, D.J. ; Hammond, G.S. (1980). "Organic chemistry". McGraw–Hill: 206. ISBN 0-07-050115-7. ↑ Denmark, S.E. ; Beutne, G.L. (2008). "Lewis Base Catalysis in Organic Synthesis". Angewandte Chemie International Edition. Weinheim: WILEY-VCH Verlag GmbH & Co. 47 (9): 1560–1638. doi:10.1002/anie.200604943. Housecroft, C. E.; Sharpe, A. G. (2008). Inorganic Chemistry (3rd ed.). Prentice Hall. ISBN 978-0131755536. Shriver, D.F; Atkins, P.W (1999). Inorganic Chemistry (3rd ed.). Oxford: Oxford University Press. ISBN 0-19-850330-X. Wells, A.F (1962). Structural Inorganic Chemistry (3rd. ed.). Oxford: Clarendon Press. ISBN 0-19-855125-8.